Do people tweet in Beaminster? Oh yes… they even have tweet-ups. The first West Dorset tweet-up was in December 2010. Where? @matkiwi’s Wild Garlic. Almost two years and half a dozen tweet-ups later, the latest WD twitter gathering was @cafeannday. @tim_harrap a self proclaimed chatter box and keen tweeter (aka @BritishCheese) helped witty writer and blogger of note @maddiegrigg organise a ‘leaving do’ to celebrate her Big Fat Greek Gap Year. She may be leaving West Dorset’s rural underbelly for a while but of course she’ll only be 140 characters away in the twittersphere. Meanwhile, face to face in Beaminster they discussed travel plans helped by a few Fat Rascals. Fat Rascals -kindly offered by @cafeannday- and tweeters @tim_harrap and @maddie_grigg. A few minutes later, a few more faces arrived. Beaminster resident @Willoqueau and her other half -sitting next to Tim- didn’t have far to come. Bridport’s @tamsinchan and @DorsetScouser (aka @DorsetbyNight) came along for the first time. @jurassiccoastin and @missseapeaches popped in on their way to Dartmoor; by which time I clearly had serious phone shake (was it two coffees I had? ), @dorset_flickr will be happy I missed her in the shot. @marion_taylor deserted Dorset for Somerset for the day. Unforgivable. @markthegarlic threatened to drive past with his tractor ‘Im working all weekend sorry’. We didn’t spot him. Too busy eating Fat Rascals. @theredbladder did not make it as he has a ‘firm and unshakable belief that after Melplash one is in danger of dropping off the edge’. Understandable. Some Dorset things don’t change. Others do; like live tweeting on air from Beaminster. 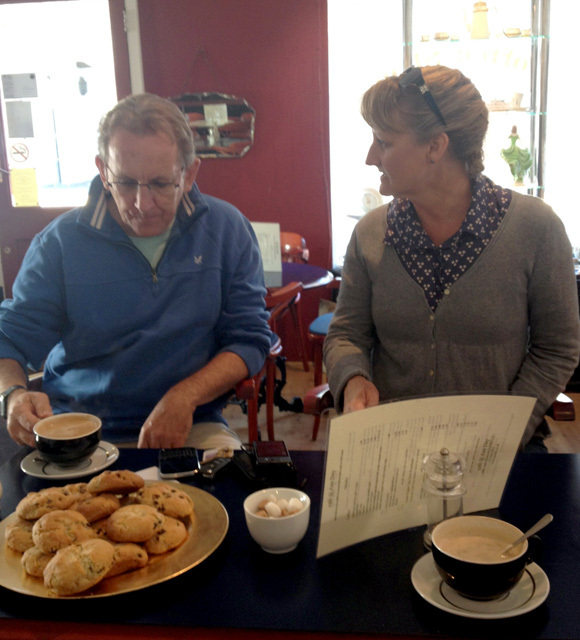 @zsk was working in Dorchester on her Big Dorset Brunch so she just brought the tweet-up to her BBC Radio Solent show via @tim_harrap and his phone who shared his Twitter thoughts with her listeners. Possibly in 1.40 minutes. And talking about Beaminster, some people have a shop counter, scissors or knives between them and a social cuppa (what do you mean better things to do?) … but tweet they do: @greendrawers, @eatdorset (pop in at Green Drawers to meet them both) @dorsetretail (he’s at Cilla and Camilla) and @marketingWestUK, @mellymop123, @helendorset not forgetting @matkiwi, all otherwise engaged. See you at the next tweet-up? ps. Joining @maddiegrigg in Greece was tempting but Bridport seems more likely. We’ll let you know. It started with a tweetup in Bridport and ended with the next director for Bridport and West Dorset Open Studios: me! 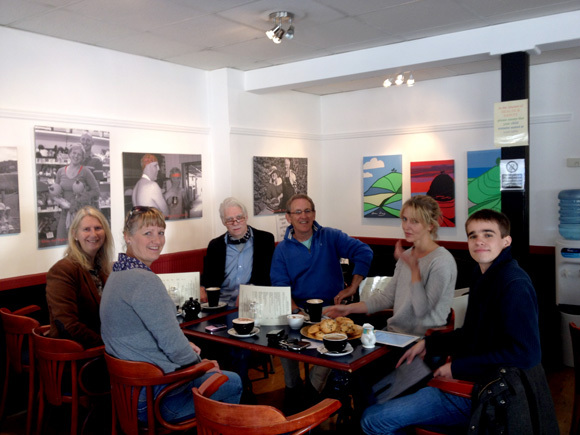 So a bunch of West Dorset tweeters had a coffee and a chat in Bridport in April. We discovered new faces behind the 140 characters and caught up with friends. @kitglaisyer mentioned that the ‘Bridport and West Dorset Open Studios’ group were looking for a new director for 2012 as Philomena Harmsworth, the current director is moving away from the area. @RealWestDorset suggested to @kitglaisyer that he thought I would do a good job. Very kind. Let’s hope he was right as Kit and Philomena have asked me to be their next director and I have agreed. We had our first meeting tonight with many artists who took part this year giving us feedback on this year’s event. It was great to see such a good turn out. There were many ideas for us to work on for next year, good things to keep and things we can try and improve on to make BOS an even bigger and better event next year. Here is my post about the event and the launch. and here is an image of the tweetup! West Dorset and Tweetup could be seen as an anachronism. I’ve had a few bewildered looks when I said I was going for my first tweetup. What on earth is it anyway? Well it’s a meetup for tweeters. Simples. “What is the agenda?” asked @LisaTandem. Good question, although I hadn’t given it much thought. I just wanted to put a real face to people I had met via Twitter; so when @tim_harrap (also known as @BritishCheese) suggested a West Dorset tweetup I tweeted great idea. The Wild Garlic seemed the obvious place to meet since @matkiwi is a tweeter of note in the foodie twitter world and his restaurant in Beaminster was a nice and convenient venue. 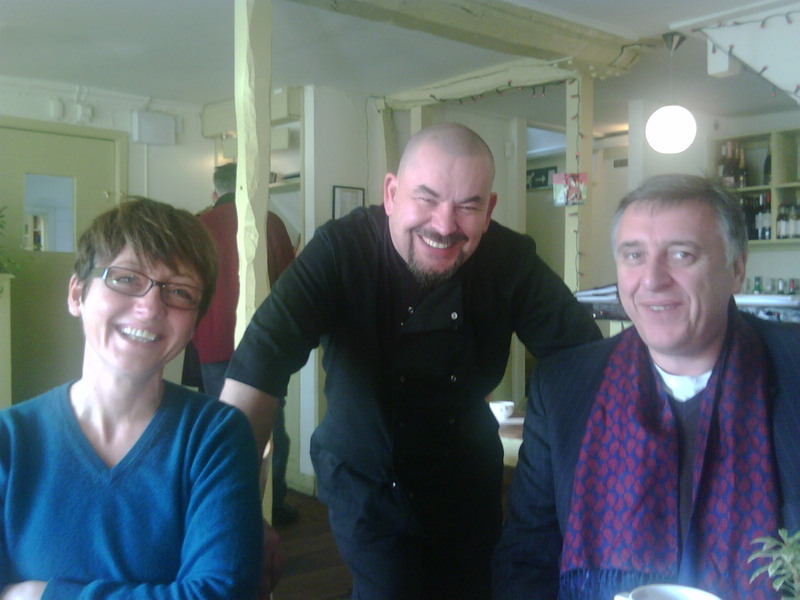 West Dorset tweetup Saturday 11/12 10.30, Wild Garlic in Beaminster. Coffee on @matkiwi (thanks Mat!) @tim_harrap will be there. Who else? And ended up with @tim_harrap, @MrCliveC, @matkiwi, @natamagat (that’s me!) and @tim_harraps’ oh (other half) discussing the twittersphere over a coffee. Don’t be fooled in thinking that there are only four people tweeting in West Dorset though. There are in fact dozens of us. Children’s plays and hangovers got in the way, many were working on Saturday morning and the rest were obviously Christmas shopping. 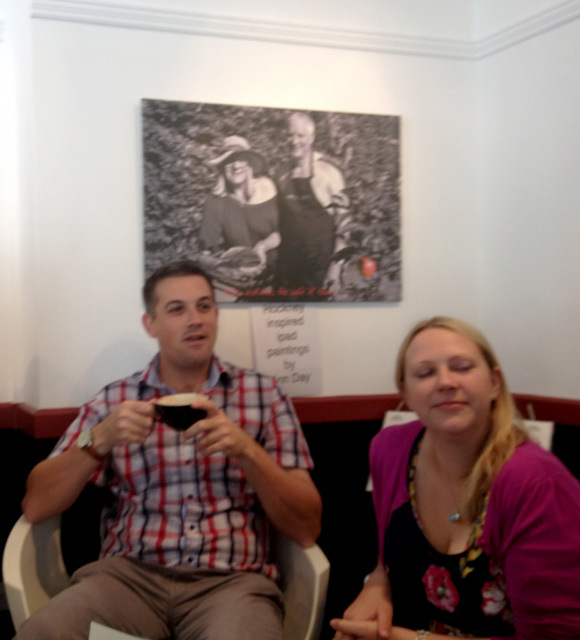 And many more don’t follow @tim_harrap or @natamagat so had no idea this West Dorset tweetup was happening. We all had interesting stories to tell. It would be wrong of me to divulge @MrCliveC’s thoughts on the place of the police in the 21st century. Being the Police Federation Chair for Dorset he needs to handle his 140 characters carefully despite tweeting in a personal capacity. Or indeed what @matkiwi might have to say about intense farming. He is of course against it, I hasten to add, but he had some interesting comments on how the press handle it. @BritishCheese gave some great examples on how twitter can be used in a large company and introduced me to twitterfall. I added my bit on why journalists have not become lazy as is often perceived but rather pushed in a corner they did not choose. We all agreed that we look for the people behind the tweets. Corporate marketing and old fashioned PR still have a long way to go in their understanding and use of social media marketing in many companies. As for our tweetup, I’d say it was a success. 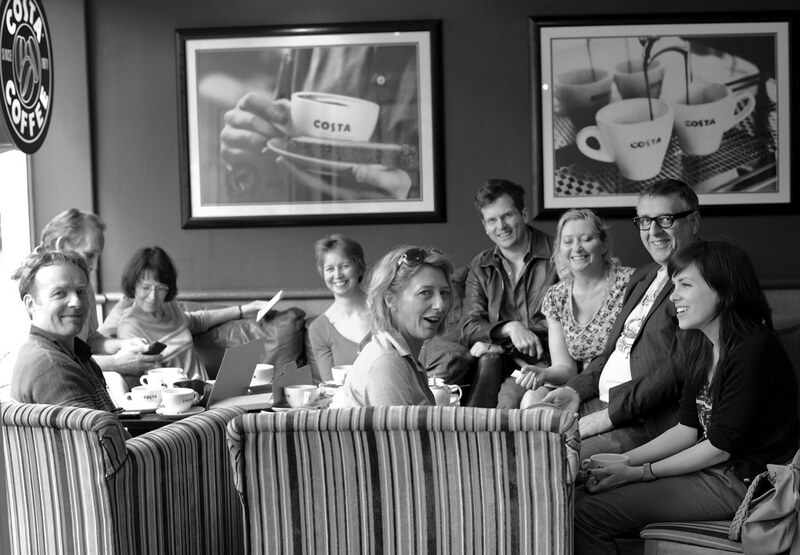 We met the real people behind the @names and I’m looking forward to meeting more West Dorset tweeters at the next one. Suggestions welcome.